Cell phone mount is a great tool which enables you to have your phone before your eyes while driving and make and receive calls and messages, and find locations on GPS, etc. But what if your cell phone holder has some extra features that make it unique? You would prefer such a cell phone holder, right? It’s now here in the form of Gravity X! How is Gravity X Unique? Gravity X is the safest, smartest and most innovative cell phone car mount which works exactly as per the rules of gravity. Therefore the patent-pending tool would have made Newton proud! Gravity X has an unrestricted opening which has silicone pads on top of which there are small suction cups. As you insert or take out your smartphone in or from this opening, it rotates because of the phone’s weight that passes the energy over to silicone pads, due to which the suction cups take a firm grip of the phone screen. The mount also has a 3M tape on its side which fixes the phone safely on the flat surface of the dashboard of the car and you can handle the phone with only one hand while your other hand can hold the steering firmly. The beauty of Gravity X is it offers you hands-free operation which is very convenient and safe especially for young drivers who use their phones almost constantly even while driving. Gravity X is suitable for any type of vehicle. Because of the hands-free operation, Gravity X facilitates the use of GPS and apps like Waze, without having to distract your attention from the road. So, what do you think? 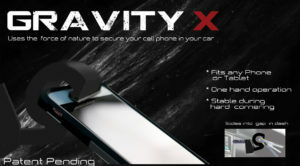 Do you agree that Gravity X stands out from other cell phone car mounts? If you think so, get it with free 2nd day shipping.